Arbitrary Contemplation: The best a (young) man can get - really! This post is about blades. No... Not the kind who bore you with their non-stop non-sense. It is about the actual blade that you use to - well, shave. Or if you are a psychopath, to deface your ex or even to kill. Reaching the shave-able age in liberalised India, where capitalism was thriving, had exposed me to the in-your-face ads of all the commercial, international brands that brandish their images in every aspect of one's life, as expected. Whether this is right or wrong (according to the left, right & center) is a debate in itself which I'm not going to go into. This exposure made me and my friends to, naturally, get attracted to buying and using them. The blade companies were no exception to this trend. We being brought up in the typical middle-class setup of emerging India, always aspire for more in terms of recognition in terms of money, fame and social circles. And we being the starry-eyed teenagers of the day, were foolish enough to believe anything the advertisers said. Like "Use our blades to shave and look like David Beckham! ", for example. What crap! Yeah. Now I know. 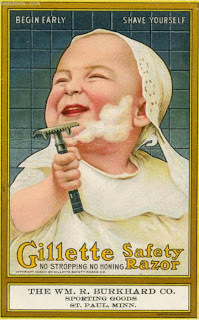 One of the side-effects of this was for us to go buy the Gillette Mach 3 Turbo triple blade for shaving. Yeah. We were that stupid. The only respite is that all teenagers are in the mid-twenties. Now we know. With the blade alone costing as much as 1/4th of the groceries at the time, I shaved as less as possible. Gillette, true to their claims, proved that their blades lasted 5 times as many shaves as normal ones. This meant that once bought, the blade lasted for almost a year and a half! Now, tell me what else can beat that! Recently, after almost a couple of months of not shaving and looking like a Neanderthal, I made everyone around question my well-being. Little did they know that I had just run out of my previous blade's life and was short of cash to buy a new set. Finally, after I ascertained that I didn't have any more essential expenses, bought a new set of Gillette Mach 3 Turbo blades and boy, was it quite an impressive shave! It was like hot knife through butter when I put it's edge to the two-month old Saharan grassland that had been growing on my face. No irritation, no rough shaves, no multiple strokes. It was simply superb! One of the few decisions as a teenager that I don't regret! Do you have a few, too? Let me know.